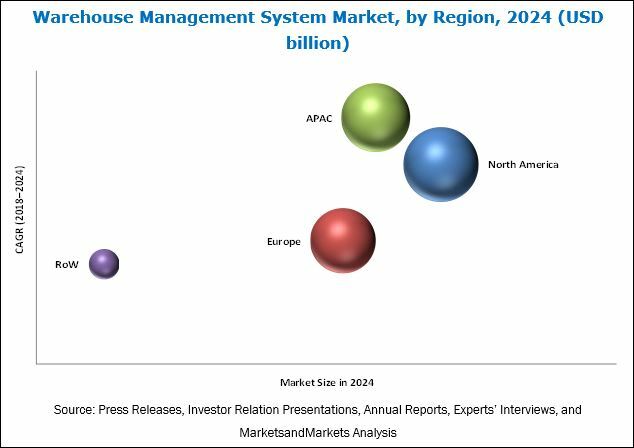 [170 Pages Report] The warehouse management system market was valued at USD 1.85 billion in 2017 and is expected to reach USD 4.82 billion by 2024, at a CAGR of 15.2% from 2018 to 2024. The growth of this market can be attributed to the growth in the e-commerce industry, emerging multichannel distribution channels, globalization of supply chain networks, increased adoption of on-cloud WMS solutions, and rising need for efficient forecasting models. The base year considered for the study is 2017, and the forecast period considered is from 2018 to 2024. The report provides detailed information regarding the major factors influencing market growth. The e-commerce industry is expected to witness a high growth in the coming years owing to the increasing number of online shoppers. E-commerce sales in APAC is likely to be the twice the size of that in Western Europe and North America combined in 2020. Increasing number of online channels is influencing consumer buying behavior. Companies operating in the fast-paced e-commerce industry need to accelerate their order fulfillment and shipping processes to maintain a competitive edge in the industry. A significant shift in consumers’ purchasing behavior has resulted in the increased implementation of real-time WMS software solutions for efficient order processing, picking, packaging, shipment tracking, and route planning. WMS helps companies quickly adapt to the changing customer requirements in the e-commerce and online shopping space. Further, the implementation of WMS helps in managing warehouses at an optimum level, with increased productivity and efficiency of warehouse operations and reduced product delivery time. This research study involves the use of secondary sources, such as encyclopedias, directories, and databases (OneSource and Factiva), to identify and collect information useful for the extensive technical, market-oriented, and commercial study of the warehouse management system market. Primary sources such as experts from related industries and suppliers have been interviewed to obtain and verify critical information, as well as assess prospects. Key players in the warehouse management system market have been identified through secondary research, and their market rankings have been determined through primary and secondary research. This research includes the study of annual reports of top market players and interviews with key opinion leaders, such as CEOs, directors, and marketing personnel. As of 2017, Epicor Software (US), JDA Software (US), Manhattan Associates (US), Oracle (US), SAP (Germany) were the major players in the warehouse management system market. Other players in the warehouse management system market include IBM (US), Infor (US), PSI (Germany), PTC (US), Tecsys (Canada), Blujay Solutions (UK), HighJump (US). In May 2018, JDA Software launches JDA Luminate, a first-of-its-kind portfolio of next generation solutions and core product enhancements. JDA Luminate is built on an open, cognitive, and connected platform that embraces digital edge technologies, such as software-as-a-service (SaaS), the Internet of Things (IoT), artificial intelligence (AI), and advanced analytics. JDA Luminate offers an intelligent way to predict and shape demand and deliver seamless customer experiences. In April 2018, BluJay Solutions acquires CSF Solutions, a leading provider of customs and compliance solutions in the German market. With this acquisition, BluJay further solidifies its position as Germany’s leading customs solution provider. In February 2018, Epicor Software opens a new technology center in Bengaluru (India). The India Technology Center is a key component of the company's globalization strategy. It has been created to support product development and services to drive performance and growth on a global scale. In this report, the overall warehouse management system market has been segmented based on offering, deployment, tier type, industry, and geography. • How do warehouse management system developers position themselves in this competitive market? • Which are the major industries that adopt the maximum number of warehouse management systems? • What are the growth perspectives of warehouse management system market in different regions? Warehouse management system (WMS) is a software application that helps manage operations in warehouses in the most efficient and productive manner. The warehouse management system market is expected to reach USD 4.82 billion by 2024 from USD 2.06 billion in 2018, at a CAGR of 15.2% from 2018 to 2024. The growth of this market can be attributed to the growth in the e-commerce industry, emerging multichannel distribution channels, globalization of supply chain networks, increased adoption of on-cloud WMS solutions, and rising need for efficient forecasting models. Software is likely to hold a large share of the WMS market during the forecast period. Increasing awareness about WMS software among small and midsized enterprises (SMEs), globalization of supply chain networks, and growing share of cloud-based WMS software solutions are the key factors boosting the demand for WMS software. On-premise deployment is likely to lead the WMS market during forecast period. Benefits such as enhanced data security, better performance and control over data transmission, and easier customizations provided by on-premise warehouse management systems are resulting in their high adoption. 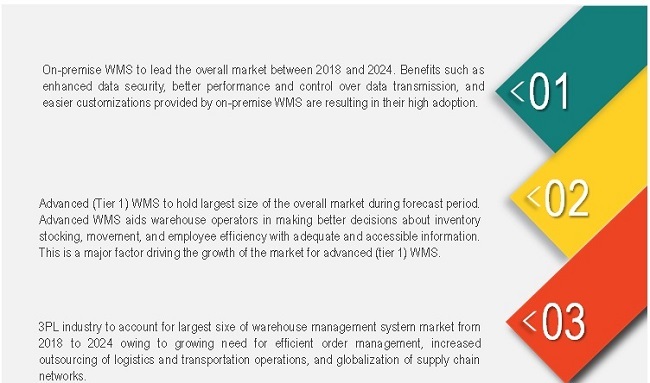 Advanced (tier 1) WMS is expected to dominate the WMS market during forecast period. Advanced WMS aids warehouse operators in making better decisions about inventory stocking, movement, and employee efficiency with adequate and accessible information. This is a major factor driving the growth of the market for advanced (tier 1) WMS. The third-party logistics (3PL) industry is expected to lead the overall warehouse management system market from 2018 to 2024. Factors such as growing need for efficient order management, increased outsourcing of logistics and transportation operations, and globalization of supply chain networks have boosted the adoption of warehouse management systems in the 3PL industry. North America is expected to account for the largest share of the warehouse management system market in 2018. Factors such as presence of large companies with global warehousing and distribution operations, growth in e-commerce industry, and developed third-party logistics (3PL) networks are driving the growth of the warehouse management system market in this region. The US is the major contributor to the growth of warehouse management system market in North America. Companies in the US are shifting most of their operations on cloud, thereby creating huge opportunities for the adoption of on-cloud WMS solutions. With the rise in demand for 3PL services, companies are handling huge inventory on a daily basis. Further, the complexity of operating a 3PL facility, particularly one that serves multiple clients, has accelerated. The implementation of WMS in the 3PL industry is vital to efficiently handle inventory and orders. WMS can seamlessly handle overlapping of inventory. These systems can also effortlessly handle any overlapping of sales orders or purchase orders, thereby saving hours required for manual data entry. The after-sales service market for the automotive industry is witnessing tremendous growth opportunities owing to the high number of vehicles sold worldwide and the increasing need for periodic maintenance. In recent times, provision of efficient after-sales services adds value to the final products as it influences customers to buy products of certain brands. Provision of an efficient after-sales service requires uninterrupted supply of essential spare parts and components, such as engine parts, suspensions, tires, electronic components, and brake pads. These spare parts are not necessarily being manufactured at same locations and are required to be transported both at assembly facilities and service outlets for customers to buy replacements. WMS plays a major role in making the inventory available at warehouses and transporting it to distribution centers as per customer requirements. With the increasing concern about food safety and quality among customers, it becomes necessary for food & beverages companies to keep a track of the sources of food products and to ensure food quality while these are being transported. Several governments worldwide have come-up with regulations to ensure superior quality of packaged food & beverages. Regulations such as Hazard Analysis and Critical Control Point (HACCP) by the US federal government, Safe Food for Canadians by the Canadian Food Inspection Agency (CFIA), and General Food Law of the European Union have been adopted by food & beverages companies to ensure freshness and integrity of food items. • Which tier type of WMS would have the highest demand in the future? • Which deployment type of warehouse management systems is preferred the most? • How is a warehouse management system deployed to facilitate various functions of a warehouse? High implementation cost of on-premise WMS for SMEs is a major factor restraining the growth of the market. Small and midsized enterprises (SMEs) account for a major share of the global economy. SMEs are looking for implementing and adopting new technologies to improve their supply chain and warehousing operations and increase productivity. However, high implementation cost of high-end on-premise WMS solutions is limiting the adoption of these WMS solutions among SMEs. SMEs generally do not have high amount of finances available to invest in on-premise WMS solutions. As of 2017, Epicor Software (US), JDA Software (US), Manhattan Associates (US), Oracle (US), and SAP (Germany) were the top 5 players in the warehouse management system market. These players focus on product launches, acquisitions, expansions, and contracts and partnerships to expand their product offerings and businesses.